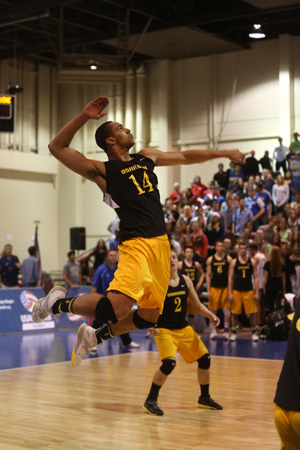 The UW-Oshkosh menâ€™s volleyball team took ninth place at the National Collegiate Volleyball Federation Division I national championship held Thursday through Saturday (April 12-14) in St. Louis, Mo. With their finish the Titans reached the Gold Division of the tournament for the 15th time in the last 16 years. UW-Oshkosh (39-12) entered the tournament ranked #11 in the 48-team event. The Titans took first place in their opening pool by defeating James Madison University (Va.), 26-24, 25-22, Ohio State University, 27-25, 25-14 and #14 University of California â€“ San Diego, 25-21, 25-22. Against James Madison University, UW-Oshkosh survived seven missed serves and four hitting errors to claw out the first set. The Titans trailed 17-12 and faced two set points before taking the two point victory. Inching ahead 11-7 in set two, UW-Oshkosh maintained at least a four-point lead until the Dukes ran three straight points to close to within 24-22. The Titans ended the match on a serving error. Brandon Schmidt (Gr. â€“ Kaukauna) led the Titans with 10 kills on 14 attempts. Matt Pedersen (Jr. â€“ Muskego) provided 25 assists, Jake Martin (Jr. â€“ New Lenox, Ill.) piled up 10 digs and Peter Nordel (Sr. â€“ Torrance, Calif.) had six kills and three blocks. John Collins (Jr. â€“ New Berlin) slammed down six kills and Sam Moua (Sr. â€“ Appleton) picked up five digs. Following the lead of their opening match, UW-Oshkosh battled back from an opening set deficit to pull out a win over Ohio State University. The Titans fell behind early and were down 22-18 and 24-22 before the Titans got a block by Collins and then Pedersen to pull even. A hitting error by the Buckeyes and then a kill by Collins finished the set. The Titans had 15 kills to dominate the second set. In an evenly distributed offensive affair, Nate Leitermann (Sr. â€“ Brookfield) and Nick Davies (So. â€“ Waukesha) each had seven kills, Schmidt added six kills and Nordel had five put aways. Matt Pedersen dished out 26 assists and had four blocks, Martin dialed up eight digs and Moua connected on six digs. Sammy Pedersen (Sr. â€“ Muskego) led the team with three service aces, Leitermann topped the team with five blocks and Matt Pedersen added four blocks. UW-Oshkosh controlled the match against the University California â€“ San Diego behind 37 total kills and 31 digs. Davies led the team with 11 kills and Schmidt had eight on 11 errorless attempts. Matt Pedersen led the offense with 23 assists and Nordel had five kills and four blocks. Collins amassed six kills and Martin and Moua each had seven digs. The Titans fell to #22 Purdue University (Ind. ), 17-25, 25-19, 15-9 to open power pool action on Friday. After a strong offensive showing in set one, the Titans struggled to put the ball away in the defeat and only had two service aces. Davies led the team with 14 kills followed by Schmidt with 11. Pedersen had 30 assists and Nordel led the team with six blocks. Martin had nine digs and Davies added five blocks. Earlier during the day Liberty University (Va.) defeated Purdue University giving the Titans the opportunity to take first in the pool if they could beat the Eagles in straight sets. The Titans did just that by defeating Liberty University, 26-24, 25-16 behind clutch play in the opening set. Davies led the Titans with 11 kills on 15 attempts and Matt Pedersen piled up 27 assists. Schmidt had eight kills and Martin reached double-digit digs with 10 saves. Davies added three blocks and Moua had six digs. In the opening round of single elimination action on Saturday, the Titans fell behind early in the opening set and this time could not complete the comeback in falling 25-23 against Penn University (Pa.). The Titans rebounded by winning the second set 25-22 before losing 15-12 in the deciding stanza. Against the defensively strong Quarters, the Titans fell behind 11-7 and 13-9 before mounting a comeback in the third set. Serving at 14-12, the match ended on a kill by Penn University. Davies led the team with 14 kills, Schmidt had 11 kills and Leitermann added seven put aways. Pedersen amassed 30 assists and Nordel had six blocks. Collins added five kills and Martin had nine digs. The Titans were hampered in the match with 17 hitting errors and nine serving errors. Since the Titans reached their first Division I Gold Division bracket in 2003, the Titans have claimed six Division I national titles (2006, 2007, 2011, 2014, 2015, 2016), two runner-up finishes (2005, 2009), two third-place finishes (2012, 2013), three fifth-place results (2003, 2004, 2017) and two ninth-place finishes (2010, 2018) become the most consistent program at the highest level of collegiate club volleyball. UW-Oshkosh was the only NCAA Division III school in the 2018 Division I tournament. Davies and Nordel each claimed NCVF Division I honorable mention All-America honors. Nordel was also named honorable mention last season and the award for Davies was the first of his career.